They said it would be transformational. I admit that I was skeptical. They said my bite didn’t align. I couldn’t see it – my teeth looked straight. They said it would improve my breathing and sleep and possibly reduce my chronic sinus and ear infection problems. That’s when I started to pay attention. “They” are a talented and compassionate trio of dental professionals: Dr. Elizabeth Eggert is my primary dentist and started me on this journey, Dr. Brian DeVoe is my orthodontist, and Dr. Karl Andreasen is the oral surgeon. Together, they developed a comprehensive treatment plan. Now that I’m three years past the surgery, I can attest that it did greatly improve my overall health. Here’s my story. While I thought my teeth were straight, what I didn’t realize was how misaligned the top teeth were to the bottom teeth. When my teeth were closed (the bite), the top teeth completely covered the bottom front teeth. I had had teeth breaking which resulted in quite a few crowns over the years. When I saw photos of the inside of my mouth, I couldn’t believe the excessive wear that had occurred on those crowns because of my misaligned bite. From the photos, I could also see the extent of the wear on my other teeth. With the teeth breaking down, Dr. Elizabeth told me that more teeth would likely break and result in more crowns if I didn’t make an adjustment to my bite. Because Dr. Elizabeth is also my daughter, she’s also aware of many other health issues I’ve had all my life, most of which were getting worse over the last 15 years. I’ve had allergies all my life which triggers asthma. The asthma was getting worse though, and I had a chronic cough from all the irritation. I was taking a lot of medications for allergies and asthma, but not getting much relief. Each breath felt like sandpaper inside my head and lungs. I had three or four horrible sinus or ear infections each year. My primary care physician even said he never sees adults with the severity of infections I had. He treated the infections but they kept coming back. They were typically limited to the right side of my head. There were times the congestion was so severe in my head that a shower sounded like rain falling on a tin roof. I always had pressure on my right side. I sought help from ENT specialists who simply said “you have a Eustachian tube dysfunction.” There were no solutions. I even had to quit the church choir after singing with that group for 20 years because I just didn’t have the breath support. Other medical conditions I had, which I now know are NOT normal, include the fact that I have never been a good sleeper – everything would wake me up. I have mild hypertension and started taking a low dose drug for that. I had worsening acid reflux and while I was on a medication for stomach acid suppression, it became less effective and I’d additionally need five or more Tums a day to feel comfortable. One day in 2014, one of my crowns popped off. Dr. Elizabeth told me I didn’t have many other options, I had to look into how I could correct my bite if I wanted my teeth to stop breaking down. So, I started with Dr. DeVoe who, shortly after, included Dr. Andreasen in the discussion. 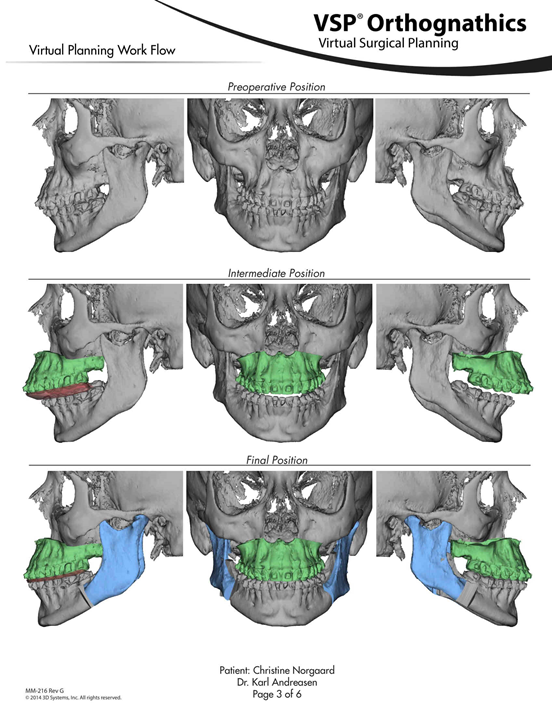 In reviewing the models of my bite and both 2D and 3D x-rays, they showed me how things were actually constructed in my mouth and my head. 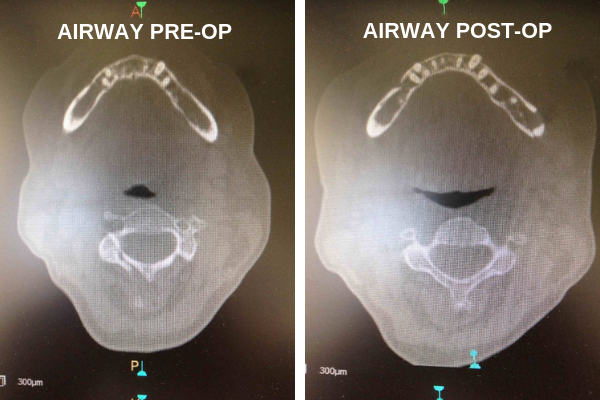 The 3-D x-ray showed the compression of my airway and the right side Eustachian tube. The airway was the size of a straw and Dr. Andreasen said that it should be more like the size of a nickel. He wanted me to have a sleep study to determine whether or not I had sleep apnea. I did – it turns out that I had severe sleep apnea and was apparently waking up over 30 times each hour. The sleep study doctor I saw said he was surprised I hadn’t experienced even worse health issues. He also told me that with the surgery Dr. Andreasen would recommend, there was a great success rate in ‘fixing’ the sleep apnea problems. The x-rays also showed that my top jaw and teeth were canted or sloped down from the right side of my face to the left. That surprised me because it wasn’t visually apparent to me. Putting it all together and with the possibility of fewer ear and sinus infections, I decided I would opt for the corrective jaw surgery. They told me that the whole process would likely take 18-24 months including the orthodontics pre and post-surgery. A week before my 60th birthday, I got my braces. Dr. DeVoe and his staff couldn’t have been better or more supportive. They told me what to expect. They were patient when a bracket would fall off (usually because I’d eaten something I shouldn’t have). I felt a little awkward starting braces in my 60’s but there were some visits where I was one of the younger patients in his office. Dr. DeVoe has a great eye for details. He gave me excellent explanations of what was happening in my mouth and answered all my questions. 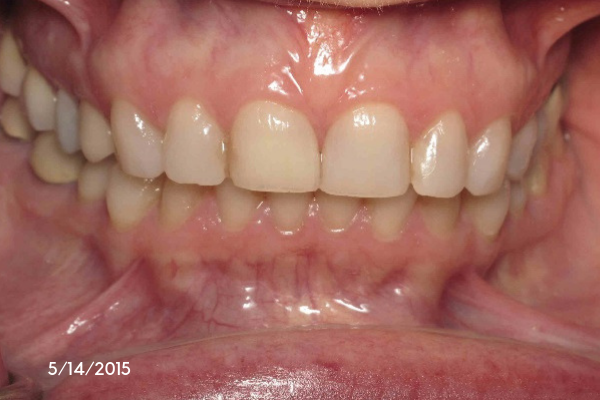 At one point, when the surgery was about a month away, it felt like nothing was aligned in my mouth. He said that was normal and that after the surgery, it would all be better and feel more natural. He was right. I had braces for nine months before the surgery and another eight months after the surgery for final ‘tweaking’ and to allow my jaws to heal. I did alter my diet after I got the braces (and again after the surgery). I pretty much stopped snacking. It was generally a decision about whether or not eating something was worth all the extra effort to clean around my braces. It was amazing because my stomach issues got dramatically better. I no longer needed Tums. My primary care physician cut the prescription for my acid reflux drug in half. I felt better. I lost a total of 45 pounds from the day I got braces, through the surgery, to the date I had the braces removed. An unexpected, but wonderful side benefit. Formally, it is called a LeFort I osteotomy and bilateral sagittal split ramus osteotomy of the mandible. It is more simply called corrective jaw surgery. There are many medical reasons to consider this surgery. For me, both the upper jaw and lower jaw were moved forward. My upper jaw was also leveled to correct the cant from left to right. I had one small stitch on each side on the outside of my face which quickly healed and left no mark. There are a series of plates and screws now in my jaw bones. All of the surgical work was done on the inside of my mouth so there are no visible signs or scars. The surgery was done at St. John’s Hospital in Maplewood under general anesthesia. I was hardly in the hospital 24 hours. I saw Dr. Andreasen several times over the first couple weeks. I felt exhausted for the first three days. There was discomfort – but I was able to tolerate it by taking four Advil every four hours. Within two weeks, I was taking only one Advil every 4-6 hours. I did some ice packs, but had very little swelling and not much bruising or discoloration. I remember how good a warm wash cloth felt on my face. On the fifth day, I inhaled through my nose, and couldn’t believe it! I had such a deep breath that I actually got dizzy. I had no idea that was what breathing could be like! It was easy – there was no feeling of sandpaper down my bronchial tubes! The information brochure that Dr. Andreasen gave me was great and very helpful. It also laid out possible complications. It explains that the nerves are exposed during surgery and tingling or numbness may occur. As I healed, I experienced some of that, especially in the area under my nose and around my upper front teeth. It took a while for the feeling to come back. After three years, the area feels ‘different’ but not in an irritating way. For the first year after surgery, I found that I couldn’t tolerate the vibrations from my SonicCare toothbrush. It was too intense. Now though, no problem. For the first few weeks, I ate a liquid or very soft food diet. No chewing. My jaw wasn’t wired shut though, it was stabilized by orthodontic rubber bands. Dr. Elizabeth gave me a recipe book of smoothies and smooth soups. This helped with nutrition and getting adequate protein. It was so exciting after a couple months to start adding back other soft foods like a muffin, scrambled eggs, or salmon that I could easily swallow without chewing. Four months after surgery, I could drink out of a straw again. It sounds like such a little thing, but it also meant that my muscles were coming back to normal. I took just under two weeks off of work. Cost? I am lucky to have great dental and medical insurance. The surgery and hospitalization were covered under my medical plan. Other than standard co-pays and deductibles, I paid little out of pocket. Was it worth it? Absolutely! It’s hard to say what the biggest benefit was. The original intent was to fix my bite. That was easily met. The doctors are all pleased with the results. I have a lovely smile! You can see my bottom teeth now. Flossing is also easy with perfectly spaced teeth. I wear my retainer every night. I keep telling people that I had no idea breathing could be so easy. I have even been able to go back to my church choir. I can also tolerate the incense at church for the first time in my life. I can enjoy my fireplace and have campfires with the grandkids. My lungs no longer feel irritated. I haven’t had a sinus or ear infection in three years! While I still have some medications (my allergies didn’t go away), all of the dosages have been significantly decreased. All my allergy triggers are still there, but because my airway is larger, I have a greater tolerance before major irritation begins. My blood pressure is lower and controlled. I sleep through the night. This is something I had never known was normal, or even possible, before surgery. Everything they said has been true. I feel great. I thank Dr. Elizabeth, Dr. DeVoe, and Dr. Andreasen for their care and expertise. It has been transformational and I’m grateful for what this has done for me, my health, AND MY LIFE! 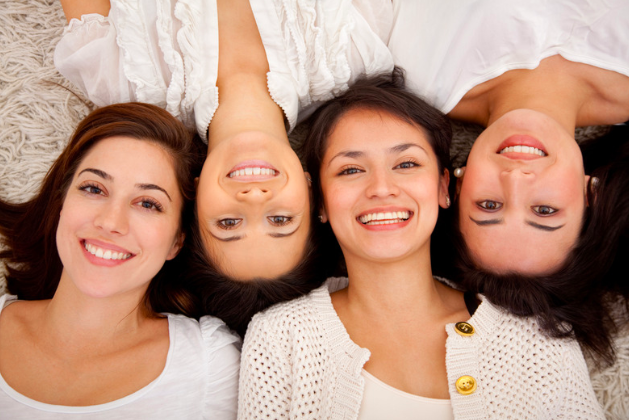 At Eggert Family Dentistry, we recognize the importance of a thorough dental evaluation. When you or your child come in for an exam, we don’t just attend to your teeth and gums. We make it our business to examine your muscles, jaw, and airway as well. 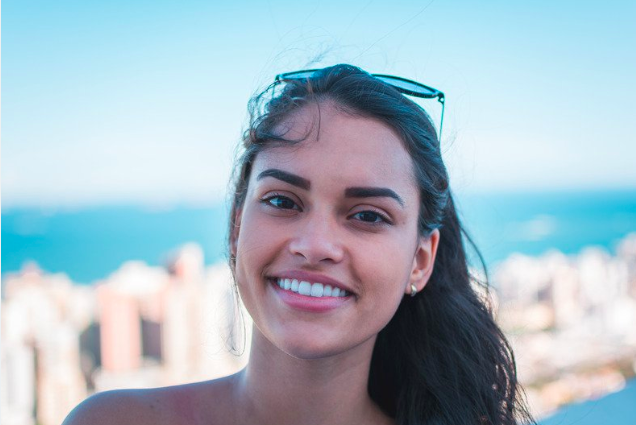 We want to ensure that your tongue is functioning properly, that you have a broad upper arch, are able to breathe easily through your nose, and are swallowing correctly. Why are we so thorough? 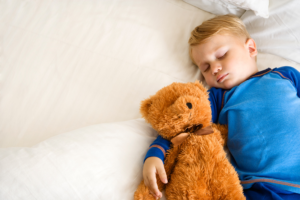 Nocturnal bruxism, or teeth grinding, is not uncommon in children and some doctors will tell parents it “normal.” We now understand that often tooth grinding, especially in children at night, often occurs because of a restricted airway. In fact, the connection between bruxism and sleep-disordered breathing (SDB) is so strong that bruxism is now acknowledged as a clinical marker for SDB and children with this disorder should consider a sleep screening. Upper Airway Resistance Syndrome (UARS) is another type of sleep disordered breathing. Unlike sleep apnea, patients with UARS typically don’t completely stop breathing, however, the resistance of air through the airway causes multiple micro-arousals throughout the night. This often creates fatigue because the body is never able to reach the deeper and reparative stages of sleep. UARS also causes more stress hormones to be released into the body as a mechanism to help the body maintain and airway. These extra stress hormones often lead to an increase of inflammatory markers and can be linked to inflammatory diseases like hypertension, diabetes, TMD, cancer, among others. 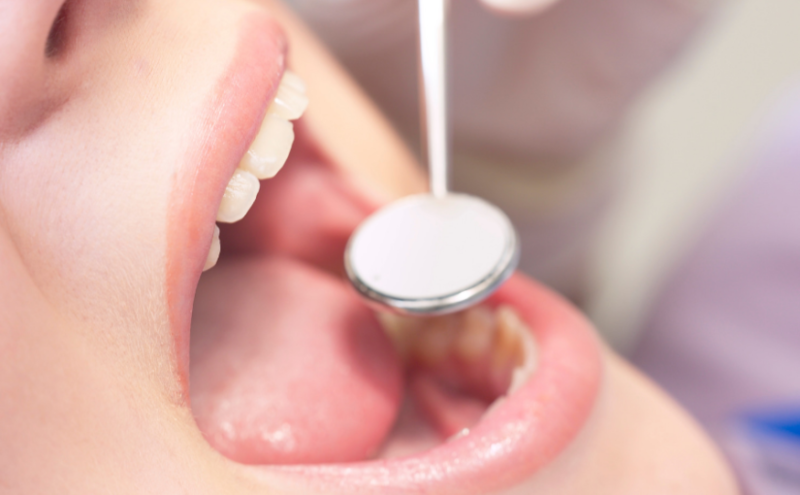 Fortunately, a thorough dental examination can help detect a wide variety of dental problems that may be caused by or contributing to airway issues and/or sleep disordered breathing. Our dental exams go above and beyond simply looking for cavities and help you achieve and maintain optimal wellness. If you are concerned that dental issues are causing airway issues for you or your child, contact Eggert Family Dentistry or give us a call at 651.482.8412! 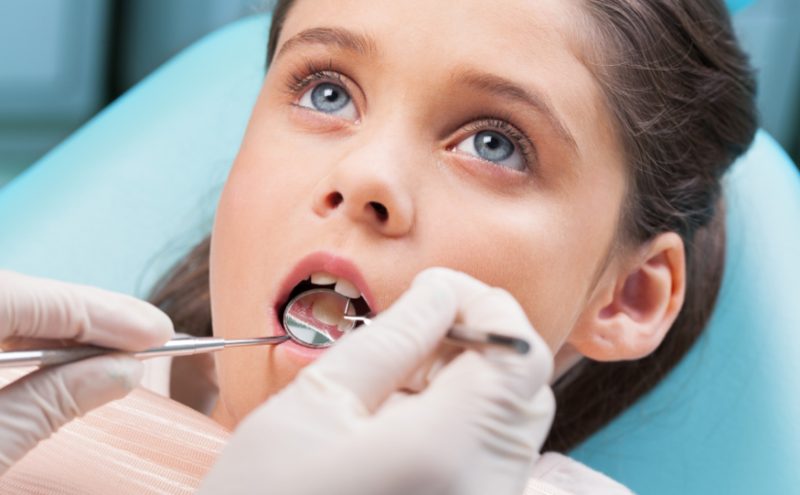 From a professional teeth cleaning to preventative screening for cavities and other looming dental issues, recare visits at Eggert Family Dentistry are an important part of your child’s healthcare routine. 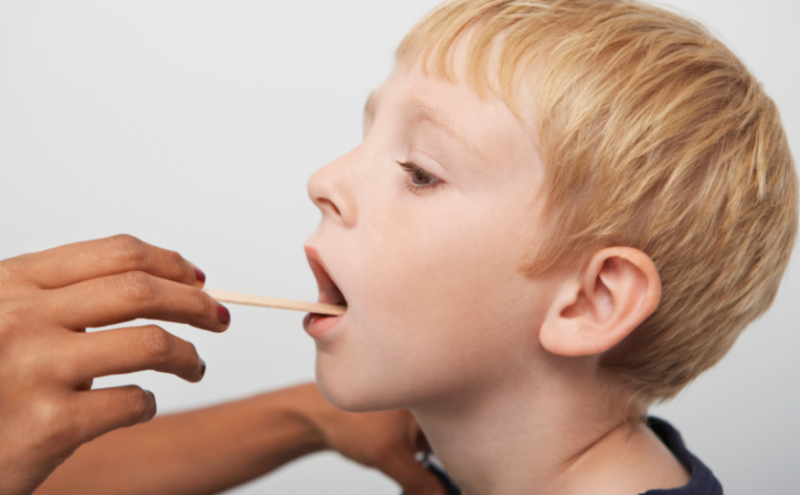 We also recognize that airway issues can mean severe health problems for your child. On this account, one of the important components of your child’s recare visit is our thorough screening for any abnormalities of the head or skull or anything unusual with the positioning of the jaw, palate, tongue, throat, tonsils or adenoids that could lead to mouth-breathing and contribute in any way to an airway issue. Air that enters the lungs through the mouth as opposed to the nose isn’t warmed or humidified in the nasal cavity. This makes a person more prone to infection. Additionally, blood gas studies cite a 20% drop in oxygen levels and a 20% rise in CO2 levels, increasing exhaustion, due to mouth breathing. Long-term oxygen deprivation can result in hypertension, malfunctioning lungs and enlargement of the right ventricle of the heart. Whereas nasal-breathing is recognized as imperative to good health, mouth-breathing has many negative effects on the body. When air hits the back of the throat, it causes the airway to dry out and lose its elasticity. This makes the airway more susceptible to collapsing. In the instance of a partial airway obstruction, children may exhibit snoring tendencies. When the airway is fully obstructed, children suffer from the dangerous effects of sleep apnea. Oftentimes, airway issues in children leads to behavioral problems. This occurs as a result of restricted oxygen to the brain, leading to fitful sleep, increased daytime irritability, distraction and hyperactivity. Unfortunately, many children who experience these behavior problems are medicated for ADHD with Adderall or Ritalin and the serious nature of airway issues go undetected. 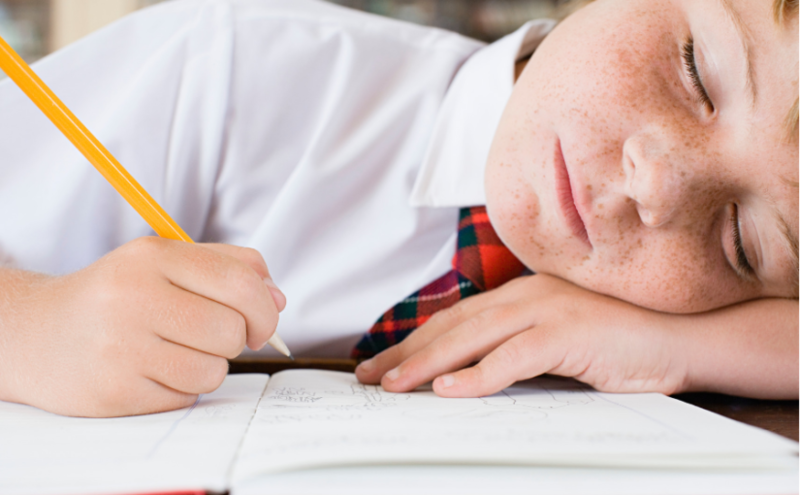 In a 2014 article in ADDitude, an online journal subtitled Inside the ADHD mind, NuSomnea claims that 50 percent of children diagnosed with ADHD show behavior improvement after being treated for obstructive sleep apnea and they suggest that up to 7 million children have been misdiagnosed with ADHD when in actuality they’re struggling with sleep issues, sometimes as severe as obstructive sleep apnea. Another serious consequence of airway obstruction in children is growth deficiency. Children struggling with airway obstruction will experience restricted levels of oxygen to the brain, reducing the amount of growth hormone their body secretes. These children will be underweight and shorter in stature than their peers and may experience a plateau in their growth trajectory. If your child is due for a recare visit or if you are concerned that your child may be predisposed to airway issues, contact us or schedule an appointment with Dr. Elizabeth or Dr. Jeff at 651.482.8412 today! There is a growing awareness about the dangers of obstructive sleep apnea. However, what most people don’t know is that sleep apnea affects adults and children alike. Early intervention for children who struggle with sleep apnea can greatly improve their quality of life and protect them from serious complications and risk of death. Fortunately, knowledge is power. When equipped with knowledge about what pediatric sleep apnea is, signs to watch for that indicate a problem, and awareness of risk factors that can contribute to sleep apnea, you possess the tools you need to intervene if a child you love is at risk. Just like the name sounds, obstructive sleep apnea is an airway blockage. During sleep, the most common cause for apnea is when muscles in the back of the throat relax, the tongue and surrounding tissues migrate back into the throat, and therefore obstruct the airway. If your child is a mouth-breather and consistently wakes up feeling tired or exhibits ADHD symptoms during waking hours, it’s a good idea to bring him or her into the doctor for evaluation. You may want to consider an appointment with an ENT who looks at sleep OR a sleep doctor directly. If you’re concerned that craniofacial abnormalities are causing sleep apnea for your child, call Eggert Family Dentistry. Dr. Elizabeth or Dr. Jeff can evaluate your child’s teeth, jaw, tongue, and airway and make recommendations. Depending on your child’s age, Dr. Elizabeth or Dr. Jeff can fit your child with an in-mouth appliance – similar to an orthodontic retainer – which helps to maintain an open airway all night long. When left untreated, sleep apnea in children can result in failure to grow and thrive, poor brain development, heart problems, and even death. If left untreated into adulthood, sleep apnea can decrease a person’s lifespan by up to 10 years, cause an increase in blood pressure, an increase in the risk of heart attack, stroke, type 2 diabetes, cancer, and dementia. Needless to say, sleep apnea is nothing to mess around with. Eggert Family Dentistry is proud to be sleep apnea savvy, serving our patients with the knowledge, skills and resources to effectively screen for and often treat sleep apnea in both children and adults. If you’re concerned that someone you love is suffering from sleep apnea, give us a call at 651.482.8412 or contact us to set up an evaluation.